Lecture, Nobel Centennial Symposia. 2001 December 6. RealMedia. 00:11:34. Lecture, The Famous Purdue Ag Fish Fry. 2003 February 8. MS Media. 02:21:02. 30th Anniversary Nobel Lecture. The Green Revolution Revisited and the Road Ahead. 2000. Transcript. PDF. Dedication lecture, Delaware Biotechnology Institute. Feeding the World in the 21st century—The Role of New Science and Technology. 2001 April 26. RealMedia. 00:47:42. The Story of Norman Borlaug: 60 Years Fighting Hunger. 2003 July 10. RealMedia. 01:29:02. Discussion, Beahrs Environmental Leadership Program. 2004 January 5–9. University of California, Berkeley. Text. ECON100A Lecture, University of California, Berkeley. 2004 Spring. RealMedia. 01:29:02. Commencement address, University of Minnesota. 2004 May. CD track. CEI Prometheus award acceptance speech. 2004 May 19. MS Media. 00:10:57. Inaugural address, 1st World Congress of Agroforestry. 2004 June 27. Orlando, Florida, USA. RealMedia. 01:06:34. Keynote speech, USDA Agricultural Outlook Forum. 2005 February 24. Arlington, Virginia, USA. MS Media. 35 minutes. Radio interview by Penn Jillette. 2006 August 9. MP3 format. 00:43:27. Editorials: "On the shoulders of giants" and "Learning from the plants" Rice Today, Vol. 8, No.4., October–December 2009. 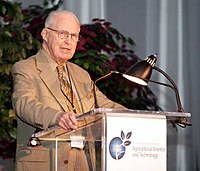 A tribute to Norman Borlaug (1914-2009): Passion, persistence and persuasion By Robert W. Herdt, Rice Today, Vol. 8, No.4., October–December 2009. Tribute to the Father of the Green Revolution Rice Today, Vol. 8, No. 4, pages 4, 6, 32-34. "Billions Served", an interview in Reason by Ronald Bailey. Borlaug papers 1941-1997 Research source in the special manuscript collection at Iowa State University. Includes materials by colleagues Glen Anderson, Oddvar Aresvik, P. Bronzi, Dr. Keith Finlay, Dr. Charles Krull, Dr. W. McCuiston, Dr. Albert H. Moseman, Dr. Ignacio Narvaez, Evangelina Villegas, G. Spoelberch and Dr. Frank Zilinsky.